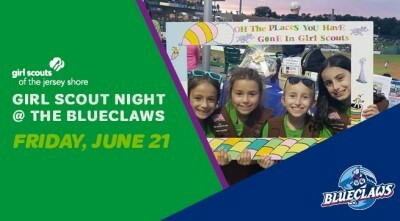 Thousands of Girl Scouts of all ages, their families and friends are invited to an amazing evening with the Lakewood Blue Claws on Friday, June 21, at 7:05 p.m. Before, during and after the game there will be featured activities that showcase programming offered by Girl Scouts of the Jersey Shore and the impact those programs make in girls’ lives. Amity Acres and Sacajawea are waiting for you! Registration is now open for our two amazing day camps - Amity Acres Day Camp in Waretown/Barnegat, and Sacajawea Day Camp in Farmingdale. Our experience at each is like no other. We provide girls, ages 3-15, with a summer of adventure with a focus on Girl Scouts’ appreciation for nature and exposure to the great outdoors. Girl Scouts of the Jersey Shore CEO Eileen M. Higgins recently appeared on a cable access television show hosted by Freehold Mayor Barbara McMorrow. They spoke about a variety of topics that involve Girl Scouts in our community. Sacajawea Day Camp invites the public to an open house on Saturday, April 27, from 10:00 a.m. until 1:00 p.m. New campers who attend the open house will receive $20 off full weeks off basic camp, boys’ camp or fireflies when registered within 48 hours of attending. Girl Scouts of the Jersey Shore hosted its annual Women of Distinction & Community Partners Gala on Friday, March 22, to support opportunities for girls in Monmouth and Ocean Counties to engage in Girl Scout programs and experiences that develop lifelong leadership skills. Everyone is invited to Amity Acres Day Camp for an open house on Tuesday, April 2, from 5:00 p.m. until 7:00 p.m.